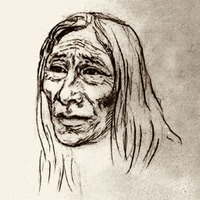 SINCLAIR, JAMES, fur trader and merchant; b. 1811 in Rupert’s Land, a younger son of HBC officer William Sinclair, an Orcadian, and his Cree or part-Cree wife, Nahovway; d. 26 March 1856 at the Cascades (Cascade Locks, Oreg.). In 1824 the HBC had granted McDermot a licence to trade in furs and later he and Sinclair “trafficked largely” in them, selling the furs to the company, which hoped by this means to keep them from falling into the hands of its American competitors. To counter the growing threat to the HBC monopoly posed by the illegal free trade in furs around Red River, the company initiated various schemes to reduce the excess population of the settlement. In 1841 it organized a party of 23 families to emigrate to the Columbia River, hoping that, as settlers, they would strengthen British claims to the Oregon, then in dispute with the United States. Sinclair led the party across the plains and through the little-known southern Rocky Mountains. With Sinclair’s brother-in-law James Bird* and the Cree Maskepetoon* as guides, they crossed White Man Pass (Alta/B.C.) to Red Rock Gorge (Sinclair Canyon, B.C. 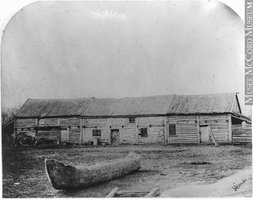 ), arriving at Fort Vancouver (Vancouver, Wash.) on 13 October. Returning to Red River from this remarkable journey, Sinclair established contacts with American fur traders. 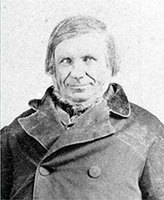 He imported American goods and became involved with Peter Garrioch and others in establishing the “cart line” from the settlement to St Paul (Minn.). He rejected a contract to smuggle furs to Norman Wolfred Kittson* at Pembina (N.Dak. ), but the HBC suspected both Sinclair and McDermot of clandestine trade and encouraging Kittson’s activities. In 1844 it terminated the partners’ freighting contracts. The HBC’s London committee had given Sinclair permission to ship tallow to Great Britain, but a consignment was left at York Factory (Man.). As well, the company introduced measures to check the import of American goods and the illicit export of furs. Sinclair, with the Garrioch group, resisted the collection of customs duties on their American imports. He struggled to get redress for broken freighting contracts and cancellation of long-standing fur-trading privileges. He joined Garrioch in smuggling to Kittson furs of an estimated value of over $2,000. 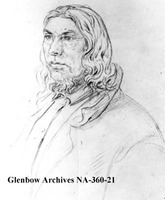 On 29 Aug. 1845 Sinclair and 22 other settlers addressed a letter containing a series of questions to the HBC’s governor of Assiniboia, Alexander Christie*, concerning their rights as natives to trade. Christie replied that they did not have more rights than other British subjects and must respect the company’s charter privileges. Sinclair carried to England a memorial in English and a petition in French which the disaffected settlers had drafted early in 1846. With the help of Alexander Kennedy Isbister*, a native of Rupert’s Land resident in London, these were submitted to the government, which declined to take any action. Eventually, after Sinclair left London in 1847, they were laid before parliament in 1849. After transmitting one more petition, this time to Governor Simpson, Sinclair decided to migrate to the Oregon Territory. He sold his house and land at Red River, and in October 1849, at St Paul, he became a citizen of the United States. He spent the winter in St Louis, arranging for the shipment of his household goods round the Horn; all were lost in a shipwreck. Intending to lead another party of emigrants to the Oregon, he returned to Red River in the spring of 1850. Floods made any group migration impossible but, leaving his wife and family at Red River, he went west himself and spent some time exploring approaches to the Rockies, no doubt in search of a new pass which he had mentioned to John Palliser* in 1848. With guides from Rocky Mountain House (Alta), where he bought supplies on 6 October, he again crossed the mountains. After some months in the Oregon and California, he returned via the Panama Isthmus, Havana, and New York to Red River, arriving on 6 June 1852. Mysteriously reconciled with Simpson, and in 1853 in alliance with him against the free traders, Sinclair entered the HBC service at the rank of clerk but with the allowances of a chief trader to take charge of and restore to efficiency the post of Fort Walla Walla (Walla Walla, Wash.) and the Snake River country. He was promised 200 head of cattle for a personal cattle-raising enterprise. He undertook, as the company’s secret agent, to conduct a second party of emigrants, including his own wife and family, to the Columbia. Leaving the settlement late in May 1854, the travellers crossed the plains and made their way up the Bow and Kananaskis rivers (Alta), over the Rockies, down another river, perhaps the Elk (B.C. ), and on by a difficult route to Canal Flats (B.C.). Sinclair reached Walla Walla late in December. There, besides transacting company business, he established himself and his family as settlers. In October 1855 trouble with the Indians flared up and the Indian agent ordered Sinclair to evacuate Walla Walla. He returned with 150 American volunteers to find, after several days’ fighting, that the post had been looted and the livestock killed or dispersed. Travelling on HBC business, Sinclair was killed on 26 March 1856 in an Indian attack on the settlement at the Cascades. James Sinclair had married Elizabeth Bird, daughter of retired Chief Factor James Bird, on 3 Dec. 1829, and before her death in 1846 or 1847 they had had nine children, most of whom died young. The eldest surviving child, Harriette, remembered the world she grew up in as one of “comfort and happiness.” Sinclair married on 20 April 1848 his second wife, Mary Campbell, daughter of Chief Trader Colin Campbell, and had three more daughters and a posthumous son. Only 45 when he died, Sinclair had packed into his short life a many-sided career as the first to take large parties through the then unexplored southern Canadian Rockies; as a pioneer promoter of trade between the Red River settlement and American centres; as a shrewd and courageous leader of the natives of Rupert’s Land in their struggle against the monopoly claims of the HBC. Paradoxically, his restless search for wider economic opportunities, which had brought him into conflict with the company, took him, before his life ended, into its service as a most valued officer. Minn. Hist. Soc. (St Paul), Ramsey County District Court, naturalization records; H. H. Sibley papers. PABC, A/C/30Si6C; Add. mss 635, file 204; E/B/Si6. PAC, MG 19, E8. PAM, Copley, “The career of James Sinclair”; HBCA, A.6/25–26; A.12/1–3; B.3/a/130–31; B.123/a/25; B.184/z/1; B.223/b/41; B.235/d/34, 38, 41, 56–57, 60, 67, 68b, 71–73, 77, 80, 82, 83, 88a, 90–92, 94–96, 100; C.1/187; 228–30; D.4/25, 34, 58, 59, 67, 74, 75; D.5/6, 8, 11–12, 14–15, 17, 26, 36–38, 41; D.5/24–25, 37–38, 41; E.4/1a, 1b, 2; E.5/6–11; E.6/1–6; E.7/34, 36; MG 2, C38. G.B., Parl., House of Commons paper, 1849, 35, no.227: 1–5, Copies of any memorials presented to the Colonial Office by inhabitants of the Red River settlement. . . . HBRS, 19 (Rich and Johnson). The papers of the Palliser expedition, 1857–1860, ed. I. M. Spry (Toronto, 1968). The Prairie west to 1905: a Canadian sourcebook, ed. L. G. Thomas (Toronto, 1975), 56–59. U.S., Senate report 528, Committee on Public Lands, 43rd Congress, 2nd session, 15 Jan. 1875. J. S. Galbraith, The Hudson’s Bay Company as an imperial factor, 1821–1869 ([Toronto], 1957). A. C. Gluek, Minnesota and the manifest destiny of the Canadian northwest: a study in Canadian-American relations (Toronto, 1965). W. J. Healy, Women of Red River: being a book written from the recollections of women surviving from the Red River era (Winnipeg, 1923). D. G. Lent, West of the mountains: James Sinclair and the Hudson’s Bay Company (Seattle, Wash., 1963). A. D. Pambrun, Sixty years on the frontier in the Pacific northwest (Fairfield, Wash., 1978). W. J. Betts, “From Red River to the Columbia, the story of a migration,” Beaver, outfit 301 (spring 1971): 50–55. J. V. Campbell, “The Sinclair party – an emigration overland along the old Hudson Bay Company route from Manitoba to the Spokane country in 1854,” Wash. Hist. Quarterly, 7 (1916): 187–201. I. M. Spry, “Routes through the Rockies” and “West of the mountains – James Sinclair and the Hudson’s Bay Company,” Beaver, outfit 294 (autumn 1963): 26–39 and 56–57. “To Red River and beyond,” Harper’s New Monthly Magazine (New York), 22 (1861): 306–21. Irene M. Spry, “SINCLAIR, JAMES,” in Dictionary of Canadian Biography, vol. 8, University of Toronto/Université Laval, 2003–, accessed April 20, 2019, http://www.biographi.ca/en/bio/sinclair_james_8E.html.